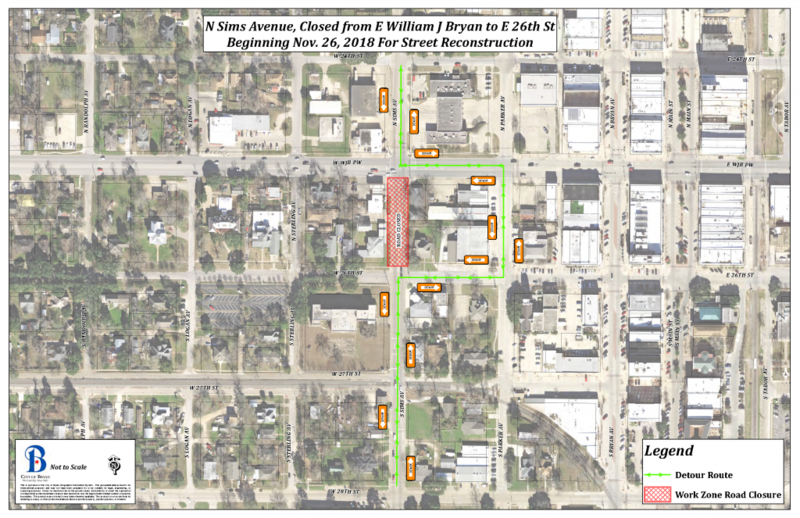 The portion of North Sims Avenue between E. William J. Bryan Parkway and E. 26th Street will be closed for road construction and maintenance for approximately 30 days beginning Monday, November 26th. During this closure, northbound/southbound traffic will be routed one block east to North Parker Avenue. Drivers are encouraged to follow the posted detour signage, utilize alternate routes, and use caution when traveling near the construction area. For more information, please visit bryantx.gov or contact the City of Bryan Engineering Services Department at (979) 209-5030.